Tené Nícole, Marketing and Public Relations will host an evening of elegance for two hundred fabulous influencers and notable guests from business, politics, media, and entertainment during its 2nd Annual #SupportYourGirlfriends Pow(H)er Awards. The curated event is being held Tuesday, November 13, 2018, at the exquisite Clyde Frazier’s Wine and Dine located at 485 Tenth Avenue in the heart of Midtown Manhattan. The evening will commence at 6:00 p.m. with a VIP cocktail reception. Tené Nícole, Marketing and Public Relations, the agency behind notable clientele and brands, continues to develop its #SupportYourGirlfriends initiative established in 2017 to support, celebrate and empower women. The #SupportYourGirlfriends Pow(H)er Awards is an annual event that recognizes highly-accomplished, innovative women for their achievements and improvements in their respective careers. Guests will enjoy five-star dining, live entertainment from Empire recording artist Jade Novah, complimentary cocktails, on-site activations, networking and dancing while witnessing the presentation of the 2018 Unapologetically HER Awards. The evening is dedicated to giving back and recognizing the works of others. 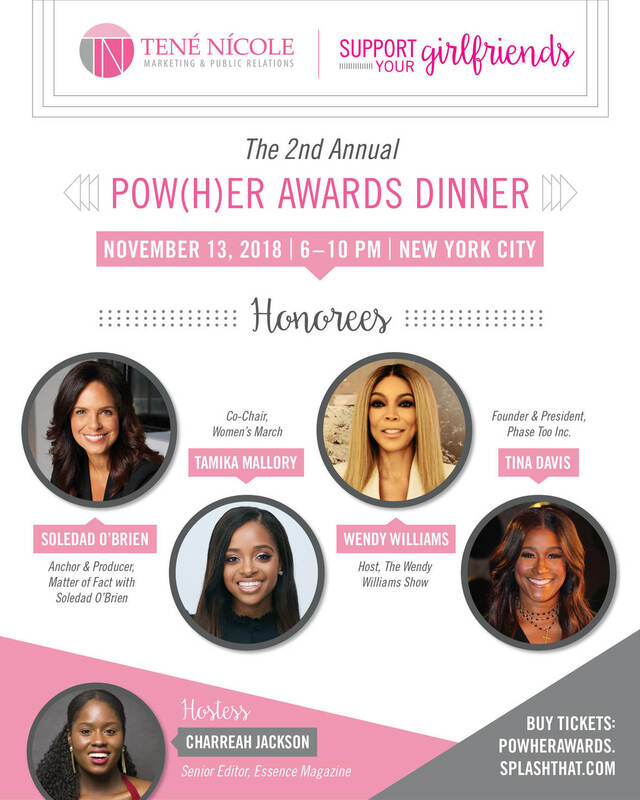 The PowHERful Foundation, founded by Soledad O’Brien and her husband Brad Raymond in 2012, will be acknowledged for its work to provide financial support to young women pursuing higher education. Additionally, in honor of National "Thank Birth Control" Day, Tuesday, November 13, 2018, the Pow(H)er Awards has partnered with Power To Decide. Power to Decide, a national campaign to prevent unplanned pregnancy, works to ensure that all young people—no matter who they are, where they live, or what their economic status might be—have the power to decide if, when, and under what circumstances to get pregnant and have a child. For more information about the Pow(H)er Awards Click Here. Media outlets interested in Pow(H)er Awards coverage should email a request to [email protected] including the outlet, number of requested credentials and type of coverage(photo ops, interviews, exclusives). Tené Nícole, Marketing, and Public Relations is a boutique one-stop full-service marketing and public relations firm located in New Jersey. The firm maximizes its clients’ exposure via an extensive network of contacts in support of their campaigns, events, goals, and initiatives. The firm delivers industry-leading media campaigns to the doorsteps of its clientele while doing its part to help create memorable experiences. Tené Nícole is a leader in its class because of its distinctive, strategic and diverse public relations model that creates opportunities and results for its clients. vikasvirdi and 6 others upvoted this.